Exciting News! Solidarity Does Make a Difference! 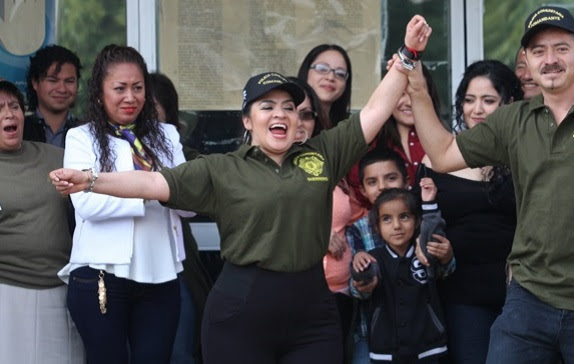 2) Nestora Salgado, Indigneous Community Police Commander, Released from Prison in Mexico! Earlier this week we reported about Monday’s direct action in front of the Washington, DC headquarters of the U.S. Agency for International Development (USAID). Former SOA Watch staff Nico Udu-Gama and Jake Dacks scaled an art exhibit to unfurl two large banners that read “Berta Cáceres ¡Presente!” and “USAID: Stop Funding Murder in Honduras.” A new video of the action from start to finish (filmed by journalist Jihan Hafiz) can be viewed at this link. On Wednesday, activists disrupted an event at Council of the Americas in Washington, DC featuring several U.S. Ambassadors to Central America by denouncing the U.S. government’s support of the criminal coup governments of Honduras over the last 6+ years. Peter Bolton and José Espada of the Latin America and Caribbean Action Network told the U.S. Ambassador to Honduras, James Nealon, that he had “blood on his hands” due to the recent assassinations of Berta Cáceres and Nelson García, and the destructive role that the U.S. has played in Honduras during the 2009 SOA-led military coup and its disastrous aftermath. An intense 45-second video of the incident can be viewed here, and the Facebook version of the video has already been viewed over 75,000 times! Also this week, many of you answered our action alert and wrote and/or called your members of Congress to demand justice for Berta and a suspension of U.S. military aid to the murderous Honduran government. 62 Representatives heard our demands and sent a strong message to U.S. Secretary of State John Kerry and Honduran officials! The pressure on the funders and enablers of the violence in Honduras is working, as Dutch and Finnish banks announced this week that they are suspending their involvement in the DESA-Agua Zarca dam project that Berta lost her life opposing, although they did leave the door open to releasing the funds in the future. Nestora Salgado, Indigenous Community Police Commander, Released from Prison in Mexico! We are thrilled to report that Nestora Salgado, Mexico-born U.S. Citizen, was freed yesterday after 31 months in prison! Last year, SOA Watch helped organize a protest & congressional visits in DC, as well as a twitter campaign in support of Nestora’s freedom. Thousands of our supporters like you also took part in an online action demanding that U.S. officials defend the rights of Nestora, a naturalized U.S. citizen, and that Mexican officials drop the bogus charges against her. Nestora was detained by the U.S.-trained Mexican Army, Navy, and Federal Police on August 21, 2013 and taken to a maximum security prison where she was held in solitary confinement for the majority of her imprisonment. Her crime? Being the respected Commander of a constitutionally permissible Indigenous Community Police Force protecting her town from drug cartels and corrupt Mexican officials and security forces. Upon her release, her family thanked all of their supporters and identified the huge amounts of grassroots and international pressure as major reasons why Nestora is now free. Another victory proving that solidarity does make a difference! Online Launch of Biden Campaign – What does Vice President Biden want his Foreign Policy Legacy to be? During the 2015 November Vigil we announced the “Biden Campaign” which seeks to pressure Vice President Joe Biden to  Support an Executive Order to Close the School of the Americas (SOA/WHINSEC) before retiring from public office in 2017; and,  Scrap the U.S.-created project for Central America known as the “Alliance for Prosperity in the Northern Triangle” or “Biden Plan”. Vice President Biden has long taken great pride in being a “foreign policy expert.” He served as Chair of the Senate Foreign Relations Committee during his decades as one of Delaware’s Senators, during which time he also supported the closure of the SOA. 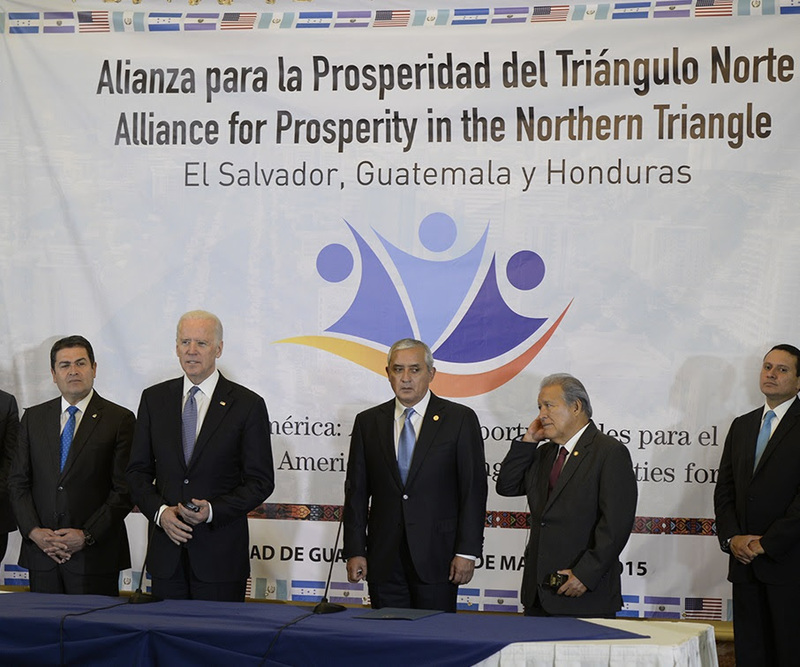 As Vice President, he has often conducted diplomacy on behalf of the U.S. government, traveling various times to Central America while strongly promoting the U.S. created “Alliance for Prosperity”, to the point that some refer to it as the “Biden Plan“. The program was announced during the 2014 “child migrant crisis” as a way to ostensibly address the root causes of migration in Central America. However, SOA Watch and many other allied organizations and independent experts oppose the Biden Plan because it funds further militarization and more development mega-projects, which are in actuality two root causes of Central American displacement and migration. We already know that you want to Close the SOA! Let V.P. Biden know you want him to act on this before leaving office in January. Let’s also keep pushing back against further militarization and the destructive mega-projects that Berta Cáceres, Nelson García, and others have lost their lives opposing! These are the exact security and development policies that fuel the Central American refugee crisis. Big changes are created by the accumulation of smaller acts of resistance. Sign the Biden petition today! We will host a workshop on the Biden Campaign in Washington, DC during the Spring Days of Action – April 14 -18, 2016. Click here for a full schedule and to register if you will be in the DC area.